PlayerUnknown’s Battleground (PUBG) Mobile has witnessed a meteoric rise in popularity in many south-east Asian markets since its release last year. Indian users, in particular, took a particular affinity to the game, which is now massively popular in the subcontinent. Unlike its PC and console counterpart, PUBG Mobile is free-to-play which played a part in making the game as popular as it is. But, when something gets too popular, bad things happen. PUBG Mobile is no exception as it has been at the centre of a particularly worrisome controversy in India. Some players reportedly died from playing it too much and another player stole money from his family for in-app purchases. Some cities even banned it, due to the hue and cry raised by parents of kids addicted to the game. What’s worse, is that the police actually arrested a few teens for ‘playing the game in public’. And now, in what seems like a move to ensure more accountability on PUBG Mobile’s part, the game has started to reportedly lock out users who play the game for too long. The change, initially spotted by some users on Twitter reveals that the game now shows a ‘health reminder’ that locks users out of the game after a certain number of hours played on the app. The message asks users to return at a particular time as a cool-off exercise. The move is reminiscent of the measures implemented in China to counter gaming addiction. While some users are reporting seeing the message after two to four hours of gaming, some are being locked out after six hours of usage. The changes haven’t rolled out to everyone just yet, but it will definitely make its way to more users in the coming days. 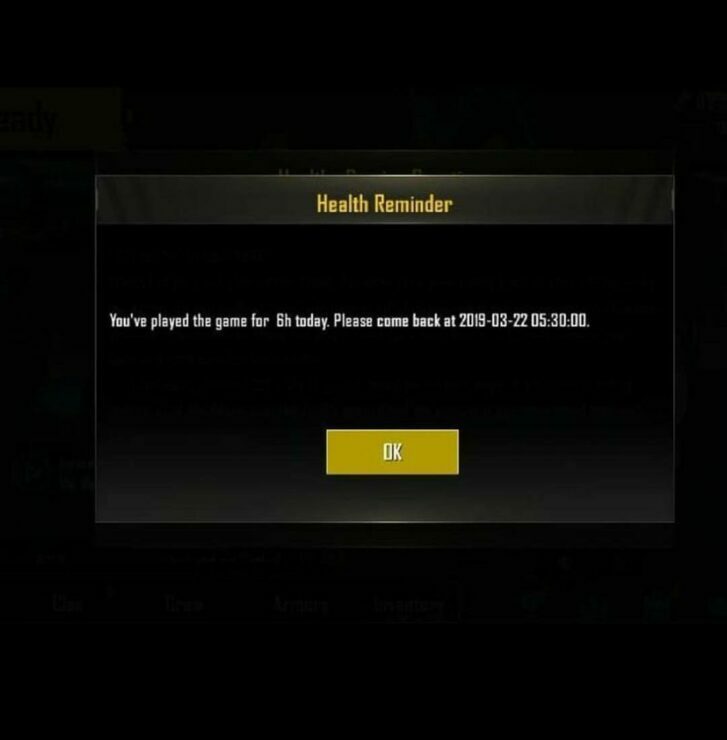 Users will obviously try to circumvent the ban, and the result will be an endless game of whack-a-mole between ingenious PUBG Mobile fanatics who need their daily fix and Tencent. I mean, since when has banning or restricting anything ever been effective? Ever since video games were a thing, we’ve heard hordes of parents whine about how its ‘ruining’ their children. It is worrisome when inept parents want to involve the state to do their dirty work.